If you require academic assistance, call The Tutoring Center, Frisco TX at (469) 980-7940. They can guide you and help you reach your potential with one-to-one tutoring in Frisco TX. If you're a free-spirited student who writes down their notes on whatever piece of paper they can find, you may notice that you're not as effective during your study sessions. This is because trying to figure out where your notes are, or if the notes in your notebook are from biology or math can take up a lot of time, and may even cause confusion. To be more effective, have one notebook for each of your subjects (and use them accordingly), so you can locate the needed notes instantly. Your notebooks are where you keep your notes (obviously), your homework, and your main study material. For that reason, you need to do your best to avoid losing them, as doing so may mean that many of your academic efforts will be lost as well. That's why it's recommended that you write your name, subject, and grade on your notebooks (preferably, on the covers), so they can be returned to you in case you leave them behind or misplace them. As previously stated, being effective is something to strive for if you want to be able to focus on having successful study sessions. That's why, aside from having a notebook for each subject, you should include a date and title at the top of each page for each of the lessons you see in class. This way, you will be able to keep better track of your lessons, which will make them easier to find whenever you have to study. You may have a neat notebook for each subject, with dates and titles, and your name on their covers. However, if the notes you take in it are messy, there's really no point in making an effort. That's why, it's suggested that you also do a good job at writing your notes in an organized, clear, and concise manner. For example, write down complete ideas in legible penmanship, so you don't have trouble decoding your notes when you have to study. The Tutoring Center, Frisco TX and their academic programs can help you master your school subjects. Call (469) 980-7940 to learn about the benefits of one-to-one tutoring in Frisco TX, or to request a free diagnostic assessment. It's not uncommon for students to disregard their notebooks' cleanliness. In fact, some may even get some pleasure in doodling all over their pages. However, something you should consider is that having a dirty notebook (for example, one with a lot of mistakes or doodles on its margins), can actually distract you, and/or confuse you when you should be studying, so try to avoid it. 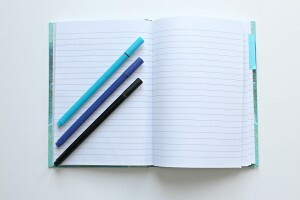 If you're one of those students who need to doodle in order to focus when they're in class, do it on a separate sheet of paper, or on the last pages of the notebook, so the doodles don't interfere with your learning. What do you do when you the teacher hands you a graded test, a syllabus, or another loose piece of paper? Chances are that, instead of taking out your folder and placing it neatly in there, you fold it up and stick it in your notebook. Still, this results in a messy notebook. Plus, there's the possibility that you'll actually lose that loose paper. Use your folder instead to prevent a blunder. On this same note, avoid ripping pages off your notebooks if you can, so you don't risk losing them, either, and so you can have a complete and organized notebook. Finally, if you want to take your notebooks' organization to the next level, you can create an index for each of them, as if they were a book. To do that, you just have to number all of the pages in the notebook. Then, at the back of it, write down which lesson is in which page. Taking this extra step will also help you in your efforts of having more organized and effective study sessions. Call The Tutoring Center, Frisco TX at (469) 980-7940 to enroll in one-to-one tutoring in Frisco TX.